Federal Hill is a neighborhood in Baltimore, Maryland, United States that lies just to the south of the city's central business district. The primary business district is bounded by Montgomery, Ostend, Light, Charles and Hanover Streets, and is home to a large number of restaurants of a wide range of taste, quality, and price, and many small shops as well as a few larger, more practical stores. The neighborhood is a popular destination for tavern goers and music lovers, with street festivals several times a year. These are organized through a very active neighborhood organization and business organization, as is the annual Shakespeare on the Hill series of summer performances in the park atop the actual Federal Hill. The neighborhood is also home to the American Visionary Art Museum and Maryland Science Center. Federal Hill is home to many popular retail, dining, and entertainment options all within walking distance for most neighborhood residents. 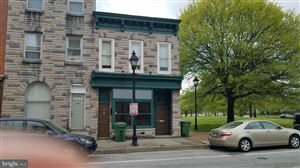 With most daily needs covered by businesses within a few blocks of the community center, Federal Hill has emerged as a premier neighborhood for the increasing number of people choosing an urban lifestyle.